Sign up for Broadjam today to follow Ocean, and be notified when they upload new stuff or update their news! 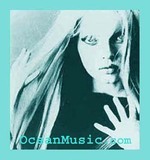 "Pondering Ocean's appealing pout will not prepare you for the psychedelic workout on this eclectic pop cd"
"Ocean's voice is just superb, no matter what the setting." "There's always something dark and intriguing in Ocean's music - and sultry. "